The Solid Ocean Fractal is a fractal in Fractals of the Mists, which is only available at the end of even-numbered levels in addition to the previous three fractals the party must complete. 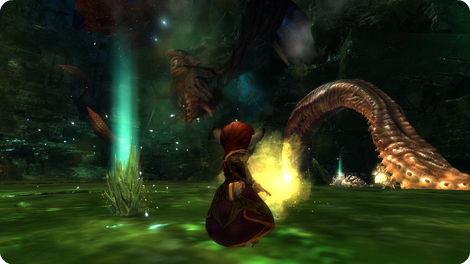 The area has a Jade Sea theme from the original Guild Wars. This guide will tell you what you will be up against, what to do when you're in the midst of it and how to get through it with flying colors. In no time you'll be getting your daily fractal chests without even breaking a sweat when facing down the Jade Maw. The Solid Ocean Fractal is a unique fractal in that it's always the last fractal you'll do when doing an even numbered fractal. You will always go a specific path and you will always face the same end boss. The difference between pre-10 difficulty and post-10 is only the Jade Maw's Agony and the amount of monsters you will face. Don't confuse the near repetition of the Fractal to be easy. however, if your party is unprepared for this, it will definitely be a disaster. If you want to get all the achievements of Fractals, then be careful that as soon as you enter the Fractal, it is time to turn around and get to handle the mobs behind you, including the crabs. For the “Open Grave” achievement you need to get down all the mobs. If you have a melee weapon, it will be very helpful to get this done more fluently, as half of the mobs you will face will have a permanent reflection aura. Right before you get to the open area with the Jade Maw you will have gained the achievement if you managed to kill all the crabs and mobs. If you're looking to get this fractal done quickly for another run, you can easily run past all the mobs to get to the area with the Maw. It is important to note that you will need a melee weapon, though, as you will still have some Jade Colossus who will reflect projectiles back at you. If you're doing post-10 difficulty you will want to keep Agony Resistance gear at hand, as its Agony attack is unavoidable. When facing the Jade Maw it can seem pretty overwhelming, but keep a few tips in mind when handling this boss. After destroying two initial Veteran Jade Maw Tentacles, a swarm of Veteran Jade Colossus and additional tentacles will spawn. The Jade Maw will then periodically place a skull icon on a random target (including downed players, minions, pets, turrets and illusions) to focus a devastating beam attack. Any player that receives the skull icon must pick up a Reflecting Crystal (dropped from Colossus and tentacles) to absorb the beam and then redirect it back at the Jade Maw for massive damage. The Jade Maw will unleash a final beam attack that quickly spreads around the fragment near its death. You can avoid the Jade Maw's beam attack with abilities like Distortion or Elixir S. The attack can also be dodged. The Agony applied by the Maw's phase transitions lasts for 9 seconds ticking 9 times in total. 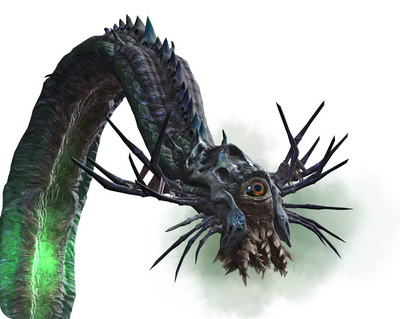 Jade Maw is the only boss in Fractals of the Mists that has Agony which cannot be avoided by any means. At the time you stand on the ground of the Jade Maw arena, stick to the left “wall” and run up towards a ledge behind the tentacles. Reach to the right ledge, and then you will be able to get behind the Maw's mouth and position to a far ledge. From here you can range down both of the Tentacles to truly get the fight started. 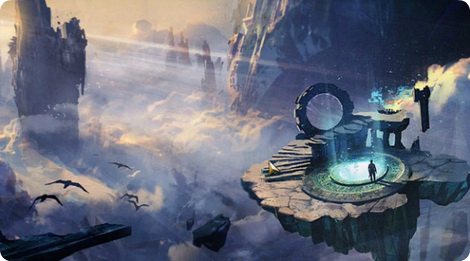 In the starting area of the Jade Maw arena are a series of blocks. Here you will have a base to draw Jade Colossus into and where tentacles can't hit you. You can gather the reflection crystals as many as you can and place them in this safe location. There's no requirement to permanently carry a reflection crystal, but instead stay close to them as you'll have more than enough time to pick up a crystal if they're nearby. If you don't pick up the crystals, they will despawn every few minutes. Be attention that when the Maw is going to die, it will target all players with the skull and do a suicide laser attack that hits everything. At least one person needs to avoid instant death by grabbing a crystal. But the fight has a bug. Even if all players are holding crystals there is a chance some (or even all) will still die. To circumvent this, your group needs one member to start running towards the Jade Maw immediately after picking up a crystal. It is said that the above laser attack can be completely avoided (with or without a crystal) if standing directly underneath the Maw. If all players wipe, the entire fight is reset to its original settings. The fight has also been reported to reset if the only surviving member goes too far from the central area before the chest appears. It may be circumvented by waiting for the chest to appear, before reviving dead party members.